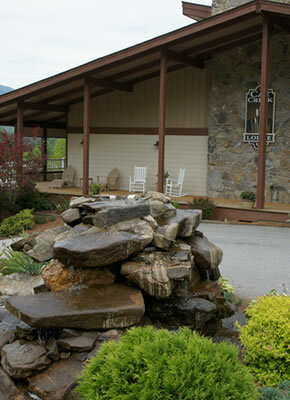 Cat Creek Lodge is located at 109 Holly Springs Village Road in Franklin, NC. From northeast Georgia, take Highway 441 North across the NC/GA state line 12 miles into North Carolina. Bear right onto 23/441 North, 64 East. Continue on 23/441 North, 64 East for approximately 3 miles. Turn right onto Cat Creek Road (in between Smoky Mountain Chevrolet and Franklin Skateway/Franklin Lanes). Go approximately 7/10 of a mile, then bear right onto Holly Springs Village Road - Cat Creek Lodge will be visible as soon as you make the turn. From the Asheville, NC area, take Interstate 40 West to Exit #27, towards Clyde/Waynesville, Highway 74 West to Highway 19/23. In about 17 miles, turn left on Cat Creek Road (in between Smoky Mountain Chevrolet and Franklin Skateway/Franklin Lanes). Go approximately 7/10 of a mile, then bear right onto Holly Springs Village Road - Cat Creek Lodge will be visible as soon as you make the turn. From the Chattanooga, TN area, take Interstate 75 North to Cleveland, TN. Follow I75N to exit #20. Exit #20 is the Highway 64 By-Pass around Cleveland. At the end of the ramp, take a right. Follow this for about 6 and 1/2 miles, and take the 64 East/Ocoee exit. In about 60 miles, after you pass through part of Murphy, NC, through a 45, then a 35 mph speed zone, turn to your right to continue on Highway 64 East. Signs are visible just past McDonald's. The turn is on the right, McDonald's is on the left. Continue on 64E for about 50 miles. Turn right onto Cat Creek Road (in between Smoky Mountain Chevrolet and Franklin Skateway/Franklin Lanes). Go approximately 7/10 of a mile, then bear right onto Holly Springs Village Road - Cat Creek Lodge will be visible as soon as you make the turn. From the Knoxville, TN area, take Interstate 40 Eest to Exit #27, towards Clyde/Waynesville, Highway 74 West to Highway 19/23. In about 17 miles, turn left on Cat Creek Road (in between Smoky Mountain Chevrolet and Franklin Skateway/Franklin Lanes). Go approximately 7/10 of a mile, then bear right onto Holly Springs Village Road - Cat Creek Lodge will be visible as soon as you make the turn. From Bryson City, NC, take Highway 74E towards Dillsboro for approximately 14 miles. Merge onto Highway 23/441 South towards Dillsboro/Franklin/Atlanta. In about 17 miles, turn left on Cat Creek Road (in between Smoky Mountain Chevrolet and Franklin Skateway/Franklin Lanes). Go approximately 7/10 of a mile, then bear right onto Holly Springs Village Road - Cat Creek Lodge will be visible as soon as you make the turn.